Lot of memes out there today bitterly denouncing all the outrage over Cecil’s murder, while ignoring the countless black Americans who have recently died tragic deaths all throughout the nation. 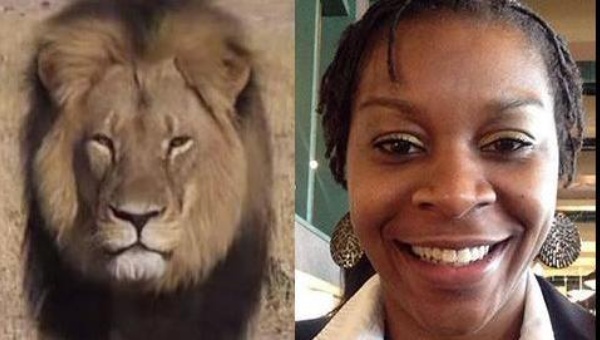 While I understand being angry at the hypocrisy of white America seemingly valuing the life of a lion over the lives of human beings killed by gun violence and racist police brutality, it’s not right to throw innocent lions under the bus for black lives, just because you feel that’s what was done to you by a cruel and uncaring white America. Blacks should be outraged about being disrespected and ignored by a country unconcerned with their suffering, and caring more about a lion in a far away country. But caring for both blacks AND innocent lions aren’t mutually exclusive, and we should be able to have enough love in our hearts for black suffering AND the barbaric murder of innocent lions in the wild. You can’t have it both ways, and ask that we value black lives, and not allow us to be outraged over the death of a lion. Yes, human lives are understandably more valuable than animal deaths, and more deserving of our attention, but does that mean we’re wrong to also be angry at the unprovoked massacre of animals and must devote ALL our attention to the scourge of racism, brutality, and violent death in the black community? Maybe I’m wrong, and we should ONLY be focusing on race relations and police brutality. Maybe that singular attention is exactly what this country needs. Lord knows we’ve ignored race for too long, and just hoped if we swept it under the rug, it would just go away. Nope. It’s gonna take some soul searching and for white America to truly commit to changing not only the laws on paper, but the racism that may still linger in our hearts. Yes, even those of us who believe we are progressive and support equality for all. It’s often us liberals who inadvertently perpetuate racism the most. Institutional Racism pervades all language, institutions, law, business, houses of worship, education, and seemingly every corner of our society. It truly is up to the white majority to aggressively weed out this widespread injustice, and take bold steps to deliver and ensure equal treatment under the law. Our hearts and minds will follow in time, but the ball really is in our court. Having said all that, does it really mean we must push aside every other cause and injustice in the world and devote all our attention on racism and delivering long overdue equality? Must we be forced to choose so abruptly? I can’t believe that attending to one group only, and fixing one societal ill at the expense of others will be helpful to us in the longterm. We must care for the wellbeing of each other, and black America should demand the attention of the majority, but not at the expense of other needy causes and concerns. Of course we need to solve our issues at home first and foremost, and of course blacks deserve for us to be angrier and more motivated by the deaths of black Americans over exotic and faraway animals, but that doesn’t mean Cecil and other innocent creatures deserve to be ignored too. We should care and do MORE to end racism and ensure the safety of the African Americans we share this nation with AND perhaps care and do LESS about avenging Cecil and punishing his killer, while still looking out for the lives of the precious animals we share this planet with.We can do BOTH, but not when one throws the other under the bus on purpose and out of bitter spite. Blacks are justifiably angry their lives are so meaningless in the eyes of white America, while those same people loudly condemn and grieve the death of an African lion. Clearly it’s better to be an African Lion than an African American in this country. We all need to remember that all boats will rise when we are committed to the success and well being of all our allies, not competing with them as foes. #BlackLivesMatter AND #LionLivesMatter, and one day, we will all be equal and thriving as one, and then we can confidently say that #AllLivesMatter.